If your looking for a move in and updated home, look no further! 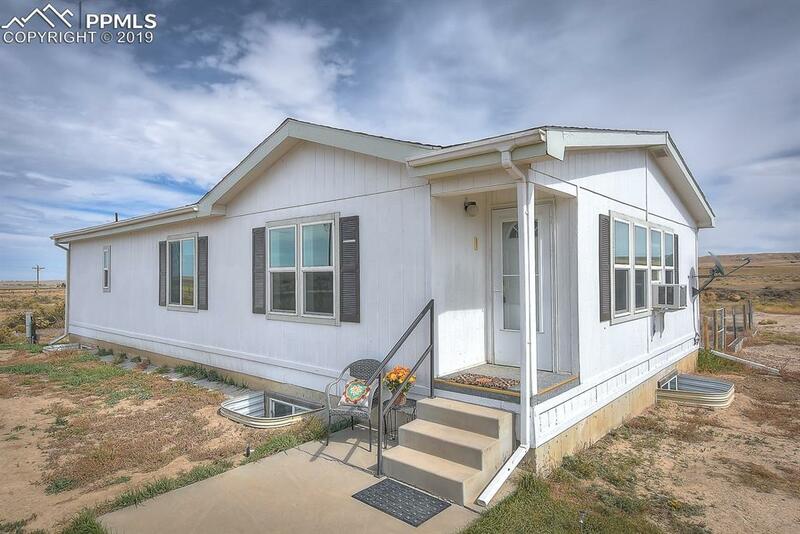 Great location just miles outside of Calhan and half mile of dirt road to this 38+ acre that is fully fenced with cool topography (see aerials). A huge bonus is the full basement that is inspected. The sellers have been busy making extensive improvements including updates to kitchen and baths, a brand new septic and leach field, all poly plumbing has been converted to Pex, new pressure tank, interior paint & more. See supplemental: Easy care laminate flooring extends through the main living area with a new kitchen floor just installed. The windows allow natural light to flow into this cozy space. There is an enclosed mudroom perfect to hang your hat and kick off your boots after spending well deserved time outside with family, friends or your horses. The area is great for riding due to the dead end street that keeps traffic at a bare minimum. There is easy access of Kanuch ("Con-U") to bring in your trailers or RV's with plenty of open space for parking. The detached oversized garage is complete with overhead garage door opener, electric and a concrete floor. This is a move in ready property with quick and streamlined closing available as the Septic is already inspected (brand new) as has the foundation and well. A-35 Zoning with no covenants and low taxes. Listing provided courtesy of Homestead Services, Inc..